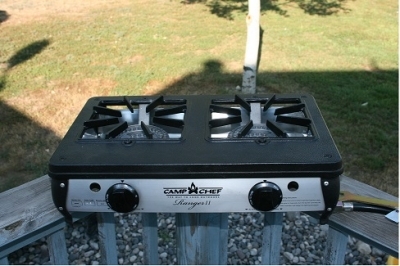 Montana Test.com - Results for: Camp Chef Ranger III Blind Stove! Reviewed! Camp Chef Ranger III Blind Stove sitting in our Duck Blind! Camp Chef has bested the competition when it introduced their pioneering blind stoves. They are the first innovators that we know of that manufacture stoves and brand them for the Waterfowler. Camp Chef launched the Ranger Blind III and Ranger Blind II; we are currently testing the Ranger III. There are others, but for superiority and purpose we have located no competitor that has the design and function like the Camp Chef Ranger Blind Stoves. The Ranger Blind III has three burners hence the three behind the name. If you want warmth or oomph for cooking you have the appropriate stove. The burners are lightweight aluminum each pushing out 17,000 BTU”s fired by the matchless ignition. The Blind III is just 5 ½ inches high, 30 inches long and 14 ½ inches wide and weights a hearty 21lbs. Space in any blind is at a premium and if those dimensions are a bit bulky the Blind II is smaller. We have operated cast iron stoves for eons the biggest difference is the The Blind III and Blind II stoves are not open or exposed like cast iron. Both Blind stoves are safeguarded with a lightweight aluminum panel protecting all four sides. The burners sit low enough in the frame and with the addition of the side panels it keeps them fired if a gust or strong wind materializes. We suggest the Blind stoves are best suitable for blinds as the name implies. Flame control is always a concern finding the sweet spot on controls with some stoves is guess work. The power nobs on the Blind stoves have a uniform response and surpass any other cooktop we have tested. For fuel we use the 5 ft. hose and a twenty pound Clear View propane cylinder. The Camp Chef Ranger III blind stove is sitting in our permanent blind right now. Our Montana Staff judge the Ranger Blind III is in a class of its own. Currently when the products we test and review are stoves the Camp Chef Ranger Blind III stands at the pinnacle of any stove we have tested. There will come a time when your need for portability will match your need for cooking power. The Ranger Stoves from Camp Chef are the answer.